The medical researcher overseeing a $2.1 million study of marijuana and its effects on veterans who have Post Traumatic Stress Disorder says she is worried her investigation will stall without the help of the local Veteran’s Affairs Health Care System. Dr. Sue Sisley, the principal investigator for the Colorado-funded research project, said she is having difficulty recruiting 76 qualified patients to participate in the study, which is taking place in Arizona. Patients must suffer from chronic, service-connected PTSD, meet rigorous screening guidelines, and be available to make weekly visits to Sisley’s Phoenix laboratory for evaluation. Sisley has been conducting the research on behalf of the Multidisciplinary Association for Psychadelic Studies, MAPS. The organization has held a 3- year research contract with the state of Colorado since April 2016. “The biggest blockade right now…is the fact that the Phoenix VA hospital will not allow us access,” Sisley said. 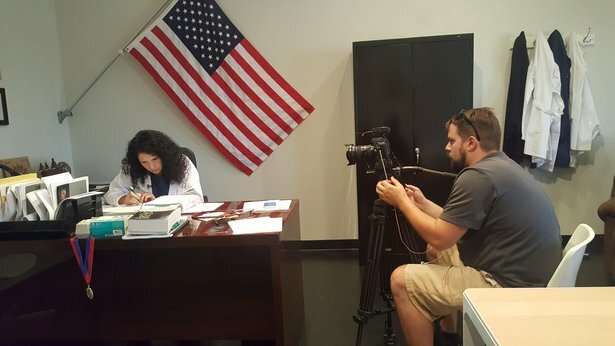 She said she has been unable to work with doctors and patients from the Phoenix VA Medical Center, which treats as many as 91,000 veterans in Arizona. “I worry that we won’t be able to complete this study because the absolute highest density of treatment-resistant PTSD patients is in that hospital,” she added. Although the study is approved by the FDA, a spokesperson for the medical center cited the federal law as a reason the Phoenix VA would not facilitate access to patients for marijuana-related research. It is a federal crime to distribute, possess, or dispense the drug, despite various state policies that permit it. “It’s not that we’re against helping her, it’s just that the laws and policies -- things like implied endorsement, relations with non-federal entities, and VA research -- don’t allow it,” Paul Coupaud, a public affairs officer, wrote in an email. Sisley said she has recruited fewer than thirty veterans for the study. She said she has pre-screened several thousand men and women who inquired about the project. She recently wrote a letter to Secretary of Veterans Affairs, David Shulkin, asking for additional assistance getting access to the VA. The American Legion also sent a similar letter in September. "If we don't see a surge in veteran enrollment in the next month," she said, "We will change the focus of the study to include PTSD of all kinds." Sisley said she would hope to change the focus of the original study to include non-veterans. In 2015, the State of Colorado approved $9 million in grant funding for nine different cannabis-related medical studies. The state allowed leftover fees associated with Colorado’s original medical marijuana registry program to pay for the research, which includes the project on which Sisley is working. “This was a very unique...once in a lifetime opportunity for us,” said Larry Wolk, the Executive Director and Chief Medical Director at Colorado’s Department of Public Health and Environment. Wolk said he’s hoping the study, which will utilize federally-supplied and approved cannabis, will provide some helpful answers to veterans who struggle with PTSD. “We’ve certainly heard from a large number of veterans that they believe that marijuana is helpful for their PTSD, but we’ve also heard from a number of veterans and treatment providers that it may be harmful,” said Wolk. Sisley has been tracking veterans’ sleep patterns and bloodwork while testing four marijuana potencies – including a placebo – during the triple-blind study. She said she recently asked for billboards to be installed in the Phoenix area, like the one below, to help with her recruiting efforts. According to Ken Gershman, the manager of Colorado's Marijuana Research Grants Program, it would be possible for the focus the study to change if MAPS were to present a new plan to the state of Colorado. Gershman said CDPHE must approve the change. It must also be approved by a federally-certified institutional review board, a private body that protects the interests of human subjects participating in research. “CDPHE thinks this is a very important study to add to the very limited evidence base about the efficacy of marijuana for treatment of PTSD," Gershman said. "Therefore, we want to do everything within our powers to support the efforts and hopeful success of the study." Gershman said CDPHE has a planned meeting this week with people involved in the study. Although the research results are not expected for several years, some Colorado veterans say they’re not waiting for scientific proof that the drug may have an impact on their condition. “I feel like I can think more logically,” said Zach Phillips of his experiences with marijuana. Phillips, 33, said the drug calms him and helps relax his tense body when he starts to relive trauma from his time in the Navy. Phillips was serving aboard the USS Nashville when it caught fire in 2006 in the Gulf of Aden. He said he fell down a ladder an injured his back on the ship. When he returned to American soil, his mind turned against him. “I was drinking a whole handle bottle of rum or vodka every night just to sedate me and put me to sleep between the stress and anxiety and the physical pain I had in my lower back,” he said. Phillips was also coping with the death of his son’s mother, who died of brain cancer after his return from deployment. “[The PTSD] was so bad for a while that I became homeless, and my son was placed with my former family members to live with because I was not in my right health or in my right mind,” he said. 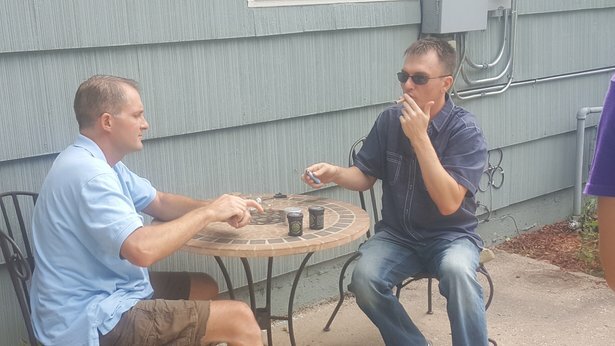 Phillips, who previously relied on a slew of pharmaceuticals for his ailments, was among a group of veterans who successfully pushed for PTSD to be recognized as a qualifying condition for medical marijuana in the state of Colorado. Despite the new Colorado rule, which was signed into law this summer, the VA will not pay for veterans like Phillips to obtain medical marijuana. Phillips makes his own cannabis oil and smokes the drug regularly. “If anything, it has inspired me. It has made me feel capable of being more of an intelligent person,” he said. Without solid evidence proving marijuana’s efficacy in treating PTSD, some Colorado doctors are steering their patients toward evidence-based treatment. Dr. Dana Monroe, a psychologist in Colorado Springs, specializes in trauma-focused psychotherapy called Eye Movement Desensitization and Reprocessing, or EMDR. It stimulates both sides of the brain while processing a patient’s trauma. According to the VA’s National Center for PTSD, it is one of the most effective treatments for PTSD. While there is evidence to support EMDR, there is not enough scientific support showing marijuana is an effective PTSD treatment at this time, Monroe said. “I think there is going to have to be a whole lot more research done before I, as a provider, will feel comfortable with that,” she said, warning of long-term studies that show concerns of increased paranoia. “I would still be of the mindset that you may think it is helping short term, but you also have to look at the long term perspective,” she said. According to the US Department of Veterans Affairs National Center for PTSD, several medications have been “shown to be helpful in treating PTSD symptoms," including Sertraline, Paroexetine, Fluoxetine and Venlafaxine. Rocky Mountain PBS filed a Freedom of Information Act request to learn the government paid nearly $19.6 million during fiscal year 2016 to fill nearly 3.7 million prescriptions of those four antidepressants. By comparison, the VA paid $107.7 million during fiscal year 2000 to cover 2.2 million prescriptions for those same four drugs. The RMPBS guide for veterans and family members who want help.